Why are flashy cartridge razors–some with as many as five or six blades–falling behind? Their many blades are quickly weighed down with hair, shaving cream, dead skin, and sebum oil. Stripping your skin and body of its natural heathy oils can lead to dryness, razor burn, and increased acne production. Enter the classic double edge safety razor: one blade, no messy build-up. But the blade itself makes all the difference. The best safety razor blades allow for a flawless shave in just a few strokes. They also prevent inflammation and have staying power that saves money in the long run. But it can be difficult to differentiate among the many brands of safety razor blades on the market today. They all advertise a smooth, close shave. Yet despite the obvious similarities, razor blades are not “one size fits all.” Personal factors like hair texture and skin sensitivity are as important as durability and price. For many people, finding the best safety razor blades is a process of trial and error. For example, the Japanese brand Feather gets a lot of buzz. Their blades are famously sharp and long-lasting. Feathers are ideal for attacking thick, coarse hair time after time without getting dull. But they are not for everyone. People with sensitive skin may experience irritation after using such an aggressive blade, and would be more comfortable with a ceramic-coated Wilkinson Sword blade. Beginning shavers are better off honing their skills with a gentler blade, like the Gillette 7 O’clock. And if saving money is a priority, Derby and Shark blades are a sure bet. Customer reviews are often polarizing, so it’s crucial for the buyer to consider his own personal shaving requirements. Here are some of the best blades available, from the cheap and easy to the pricey and ultra-strong. These double-edge, platinum-coated Japanese blades come with a cult following. Feather blades may not hold the wisdom of the samurai, but their laser sharpness and longevity has earned them fans all over the world. They come individually wrapped in packages of 10, 30, or 50. The blades are made to suit a variety of double-edge safety razors. Astra is a favorite brand among barbers. 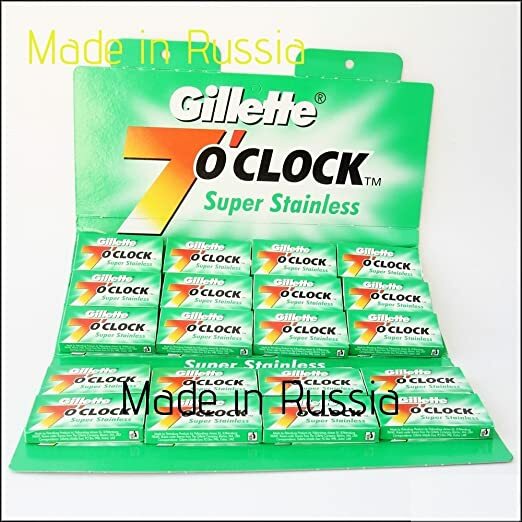 The blades, which are crafted in Russia, fit into popular standard razors like Gillette, Merkur, Parker and others. They come in 20 tucks of 5, and each blade is individually oiled, labeled, and wrapped in paper for optimum professionalism. A sleek platinum coating prevents irritation and ingrown hairs when shaving. Don’t be fooled by the unpretentious packaging. The chromium-coated stainless steel blades are now 25% sharper, but they are still comfortable enough to use when experimenting with shaving techniques. Blades are individually wrapped to permit the removal of one blade at a time. Personna blades are made in the USA. Shark blades come highly recommended by barbers and wet shavers. The super chrome blades are crafted in an ISO2000-caliber facility. They are coated with polymer for an effortless, nearly silent shave. One Shark package contains 20 packs of 5 blades. After shaving with a Shark, one must shake the blade dry instead of wiping it off, as wiping can remove the blade’s polymer coat. 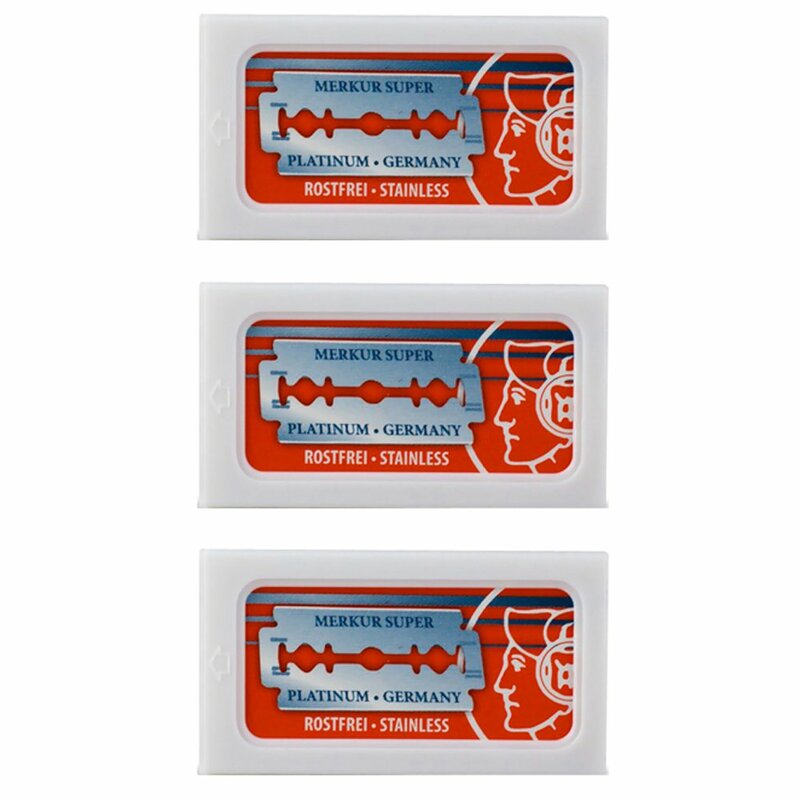 Since the late 1950s, Wilkinson has been a trusted name in the world of razor blades. They pioneered a triple-coat approach to protecting stainless steel blades: a coat of chromium to fight corrosion, a coat of ceramic to add strength, and PTFE(polytetrafluoroethylene) to limit irritation. Sword blades fit into all standard double-edge razors. Packs of 100, 200 and 300 blades are available. Merkur knows razors. The Germany-based company has been manufacturing high quality shaving equipment since 1906. Over time, they have perfected the flexible, effective stainless steel blade. At a value of 60 cents per blade, the combo pack is more pricey than some of the other options on this list. The blades fit into all double-edge safety razors, not just Merkur brand tools. These are the cheapest blades on the list, at only approximately $10 for 100 blades. They fit many types of Shavette-style and straight razors. 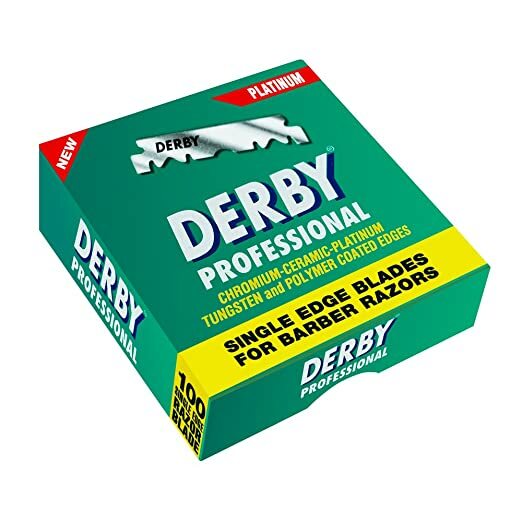 Derby blades are derived from a steel strip from Sweden. Their cutting edges are deposited with tungsten, platinum, and chromium ceramic. Polymer coating allows for the smooth glide of blade over skin. Like the Derby blades, the Gillette 7 O’clocks are well suited to those who are new to shaving with a double-edge safety razor. These Russian-made blades are not as aggressive as Feathers, but sharp enough to get the job done on the first or second pass. The pricing is middle of the road, at around $17 for a package of 100. There are 5 blades in one tuck; 20 tucks are mounted on a display card. If you’re ready to ditch your cartridge razor and explore other options, double edge safety razors are a good place to start. They’ve been around since the 19th century, along with a plethora of shaving accessories. Of these, blades are naturally the most important. Don’t be intimidated–safety razor blades are generally easy to load, use and dispose of. Their simplicity makes them kinder to your skin than common multi-blade contraptions. The brands above have proven their worth to thousands of discerning shavers. Look to your own skin, hair, and wallet to determine which safety razor blades are right for you.